It's Friday and it's hot-hot-hot. I made the mistake of going out to J. Pace, not even 50 paces from the door of my building and nearly died in the shade. Ack! 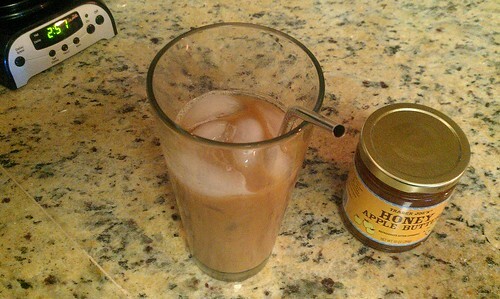 I'm living on iced coffee made with honey and coconut milk. What is getting you through the heat? Chloe is beating the heat with lots of naps. Her favorite place right now is the produce basket on the kitchen counter. Kittykins has been home with us for a week and a half now and it's been the best week and a half. As we were falling asleep last night, Gabe and I agreed that Chloe makes us a trifecta; the perfect little family. Watching Gabe interact with Chloe has increased my affection for him tenfold. He is so gentle, attentive, kind, and patient with our curious, spunky, and teleporting little one. She has come to love climbing up the side of the bed, under the sheets, to find out what the "monsters" are that she attacks through the bedspread. She lies waiting for us to walk by the bed during the day to reach out and grab our feet and play bite; we're actively training her out of the biting. And she looooves her squeaky mouse, fluffy ball, and "fishing pole" Daddy made her. I'm so glad Chloe is in our lives. Almond milk makes delicious dairy-free scrambled eggs! I tried it this morning for my post-training session meal and I was surprised by how light and slightly sweet the flavor was. I've tried coconut milk and water since removing soy milk from our kitchen and those didn't really work. The coconut milk changed the flavor too much and I didn't like it; the water was boring and dulled the flavor. Almond milk, though; almond milk works. We picked up Trader Joe's almond milk yesterday. It's really good and the best price I've seen for pre-made at $1.69 per container. Whole Foods store brand is $1.99 and any other name brand is at least $.30 to $.50 more expensive. I <3 TJs. 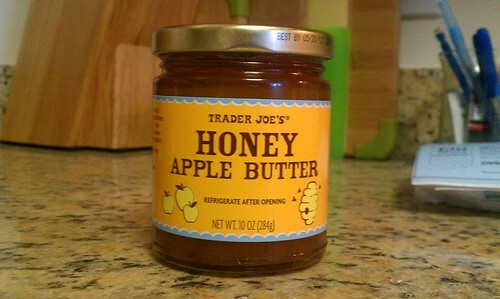 We also found honey apple butter! I was thrilled to find this little jar sitting on the shelf. My former father-in-law makes pear butter and apple butter. I loved it and miss it. I've tried a few different brands and I haven't found any I like, nor have I tried making it myself yet. I have a good replacement, though. I really enjoyed the TJs version! 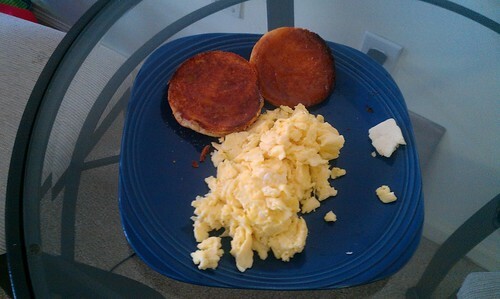 It's really good on the TJs gluten-free English muffins (good and cheap!) and I look forward to trying it on the TJs gluten-free French rolls (very good and cheap!). This weekend I am going to try a new soup recipe: banana coconut soup. It can be made vegetarian-friendly by omitting the stew beef, and it is paleo friendly. I'll let you know how it goes. I hope it's good! I don't want another failed trial this week. In training news, I have made some huge breakthroughs! I was measured again last Friday and I've lost 5 pounds (total of about 15! ), about a 1/4-inch everywhere, and all my body fat points went down, some by 10 points! I'm so thrilled! But that's not what makes me really happy. I've put in two easy two-miles runs this week. Each time I was thrilled that I didn't huff or puff ONCE! My lungs and heart were strong and stayed in the "low exertion" range, meaning my heart didn't feel like it was going to beat out of my chest nor my lungs scream for a break. This shocked me. Getting to this point has never been so quick. The hard training has got to be a huge contribution. I'm so proud to say that I hit my groove. My cardiovascular system is back to where it was pre-illness; my endurance and running strength has improved immensely; my body has never felt this strong. This is after about three months of training hard. I plan on continuing with my personal trainer even after we move to Revere because I have found someone who can help me reach my goals. If you need a trainer and are in the Boston area, let me know. I can give you his information. He's the best thing that ever happened to my fitness life. The point sticking out to the far right was hollowed out during WWII and used to house nuclear missiles! Now it's a park. I love having good friends with kitties in Marblehead. When they travel, I come over and stay with the kitties and enjoy the ocean view from the living room. Thanks, Alison! One of the other wonderful things about the opportunity to kitty-sit is the chance to go on scenic ocean-side runs. Yes, I live by the ocean in Boston, but it's not the same. My shore line is industrial and busy. The shoreline out here is residential and beautiful. For the next week while I'm here, I'll be enjoying the ocean run twice a day. My personal trainer wants me to get cardio in twice a day and running is my cup of tea, so there we go. When I get back home to Boston, I'll mix it up with cycling and the elliptical in the gym. Hurting So Good: the day after working with a personal trainer. I knew I was going to have my arse kicked, but I didn’t realize just how good it would feel! I had my first session with my personal trainer yesterday and he put me through my paces and jumpstarted my system to get ready for a killer 12 weeks of intense training. We talked about my goals up front, which are to get beautifully strong, lean, lose the pounds I've put on through illness, depression medication, and other lifestyle habits that need tweaking, and increase strength and endurance for running. He’s got me covered. and this is where I started to reeeeaaaalllly feel it: burpees. 10 burpees. I don't remember everything we did, but I do remember we did two sets of this killer workout. I've got two sessions a week for twelve weeks to look forward to, on top of my running training and solo routine in the weight room. I knew I was going to have my arse kicked, but I didn’t realize just how good it would feel! I had my first session with my personal trainer today and he put me through my paces and jumpstarted my system to get ready for a killer 12 weeks of intense training. We talked about my goals up front, which are to get beautifully strong, lean, lose the extra pounds, and increase strength and endurance for running. He’s got me covered. Three hours later, I’m feeling sore, but good. Really good. I look forward to getting on the road in a few hours to pound out a few miles to round out the week. Onward and upward from here!